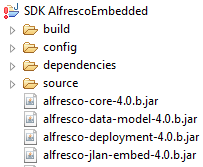 With each release of its solution, Alfresco provides a SDK bundle that allows to develop Alfresco Java extensions. « Installation » of the SDK in Alfresco is pretty simple: use Eclipse import feature and select « SDK AlfrescoEmbedded » in the list of projects. That’s all! The second error in list helps us finding the cause of the problem: « .classpath » XML file is not well formatted. Just remove those characters in order file starts with <?xml… as every XML file should. Now refresh your Eclipse project. Cette entrée a été publiée dans Alfresco, Technique, avec comme mot(s)-clef(s) 4.0, Alfresco, Bug, classpath, Eclipse, SDK. Vous pouvez la mettre en favoris avec ce permalien.